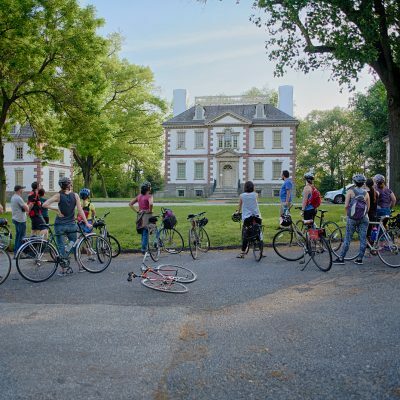 Discover and explore six historic houses, their architecture and history, on this fun and engaging 3.5-hour scavenger hunt in Fairmount Park. Purchase tickets before May 7 to receive a $5 Early Bird discount! Teams will use a free Android/iPhone compatible app called Scavify which can be downloaded by all team members prior to the event. You do not need to create an account for Scavify, simply download the app. Team members will receive a password when signing in for the event on 6/16 which will give them access to all the clues. It is important to choose a team name before purchasing tickets to ensure a quick sign in process on the day of the event. ALL NEW CONTENT FOR 2018 including bonus activities for teams who want an extra challenge. These are optional clues that will take you into more remote sections of the park or are particularly challenging physically or mentally. Outward Bound will provide a fun and challenging team activity at the beginning and end of the scavenger hunt. Each team receives a complimentary map of Fairmount Park. This event is rain or shine. Dress appropriately! Each participant will receive one free drink to redeem at Parks on Tap at Belmont Plateau the end of the hunt. Every team is a winner! Each team is eligible to win swag at the end of the hunt at Belmont Plateau. We plan for every team to win something! We may give something a little extra special to the team finishing first and perhaps the team finishing last! $20 for Fairmount Park Conservancy members and $25 for non-members. Learn more about membership with the Conservancy here! ONLY 100 TICKETS AVAILABLE! DON’T MISS OUT! Celebrate your team’s accomplishments with prizes, drinks, and eats at Parks on Tap at the Belmont Plateau following the hunt. Read all about last year’s inaugural Historic Fairmount Park Scavenger Hunt here! For any questions related to the hunt, please contact Ed Miller at emiller@myphillypark.org or 215.607.3492.